Cabin Passenger list for the SS Leviathan of the United States Lines, Departing 5 August 1924 from Southampton for New York via Cherbourg, Commanded by Captain Herbert Hartley, U.S.N.R.F. The S. S. Leviathan, ex-Vaterland, is the flagship of the USL at 59,956 Tons Register, an American Quadruple Screw Turbine steamship. There were approximately 616 First Class and 500 Second Class Passengers on this voyage. Includes extensive Information for Passengers Section. Mr. F. R. Handlin Jr.
Mr. W. C. Neilson Jr.
Mr. G. F. Hardy Jr.
Mr. E. A. Watkins Jr.
INFORMATION OFFICE.—This office, located amidships on “E” deck, hasbeen provided for the convenience of Passengers, and all inquiries for information of a general character should be made there. PASSENGER DEPARTMENT REPRESENTATIVES, located in the Purser’s Office, are ready to give information concerning sailings and bookings on the UNITED STATES LINES and other services being operated by the U. S. Shipping Board steamers. Sailing lists, rate sheets, cabin plans and other information will be cheerfully furnished. Reservations can be secured and deposits to cover will be received. LETTERS, CABLES AND TELEGRAMS are received at the Information Office for dispatch. Cablegrams and telegrams should be handed in an hour before the arrival at any port of call. None of the ship’s employees, other than those on duty in the Information Office, are authorized to accept letters, cables and telegrams for dispatch. PASSENGERS ADDRESSES—Passengers are urgently requested to fill in the blanks, asking for forwarding addresses, which are distributed on board. If this request is complied with, all undelivered mail, telegrams, etc., will be forwarded immediately. Passengers may have Mail, Telegrams and Cables sent in care of any of the UNITED STATES LINES offices. Letters for incoming passengers on the UNITED STATES LINES steamers are accepted for delivery in special bags made up in New York, Paris and London Offices, for distribution on board. Passengers will please call at the Information Office for them. The PURSER’S Office is located amidships, on “E” deck. The CHIEF STEWARD’S Office is located amidships, on “F” deck, near entrance to main Dining Saloon. HIGH SEAS MAIL.—United States Postage Stamps and rates are used when mailing letters, and such letters should be posted in the ship’s letter box in the ordinary way. The mail bag is closed a few hours previous to arrival. Full particulars can be obtained at the Information Office upon application. FOR LETTERS MAILED IN THE UNITED STATES. Rates on letters to points in the United States, Canada and British Colonies, and to Great Britain and Ireland, two cents an ounce or fraction thereof. Rates on letters to all other countries—five cents for the first ounce, and three cents for each additional ounce or fraction. Rates on postal cards to all countries (except United States, Canada, Cuba, Mexico, and Panama, one cent to each)—two cents each; on return or reply cards, four cents each. Postage stamps can be purchased at Information Office, Library Steward and Novelty Booth. EQUIPMENT.—The radio equipment of the “Leviathan” is of the most modern R.C.A. type, manufactured especially for this ship, and embracing the latest improvements developed by the General Electric Company, the Western Electric Company and the Westinghouse Electric & Manufacturing Company. It is the most powerful apparatus on any passenger ship afloat, capable of maintaining direct communication with land throughout the entire voyage. SERVICE.—Radiograms may be filed at the radio office for anyone—anywhere—anytime. The words in radiograms are counted and charged for in the same manner as cablegrams. Through the special long distance service made available by the Radio Corporation of America (RCNEWYORK), passengers can keep in close touch with business and personal affairs even though the ship is in mid-ocean. SHIP TO SHORE.—Full information regarding rates to all points may be obtained at the radio office. SHIP TO SHIP.—Radiograms are also accepted for passengers on other ships, for which the charge is 16c. per word. OCEAN LETTERS.—Ocean letters, not to exceed 100 words each, may be filed for transmission to a ship proceeding in the opposite direction. Such messages are mailed to destination from the first port of call of the latter vessel. The charge is $1.20 for first twenty words and 4c. for each additional word. 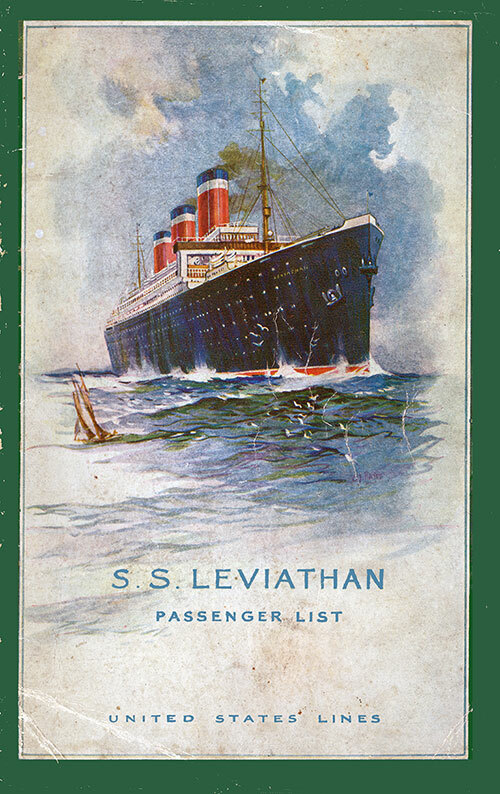 SHORE TO SHIP.—Radiograms for passengers on the “Leviathan” may be filed at any public telegraph office. Messages originating in the United States, addressed to passengers, need only be routed RCNEWYORK. NEWS SERVICE.—The “Leviathan” subscribes to the Chicago Tribune—RCA News Service, which is transmitted by the powerful radio station at Chatham, Mass. The daily despatches, consisting of from 800 to 1,000 words of the world’s latest news, results of sporting events, stock reports, etc., are received on board during the early morning hours and printed in the daily paper published and delivered to passengers. RADIO TELEPHONE.—The “Leviathan” is equipped with a complete radio telephone transmitting and receiving outfit of the most modern duplex type. However, until other ships and shore stations are provided with similar apparatus, the telephone service is, of necessity, restricted. Breakfast, from 7.30 A. M.
Luncheon, from 1.00 P. M. to 2.30 P. M.
Dinner, 7.00 to 9.00 P. M.
Breakfast, 8.00 to 9.00 A. M.
Luncheon, 12.00 Noon to 1.00 P. M.
Dinner, 6.00 to 7.00 P. M.
SEATS AT TABLES.—Applications may be made to the Chief Steward in advance, or on day of sailing on board the Steamer at the Second Steward’s office located on “D” deck amidships, or in the Dining Room. SMOKING.—Passengers are requested not to smoke in the Main Dining Saloon. ORCHESTRA.—The vessel carries a first class orchestra which will play daily at the under-mentioned times and places. Musicians are	not authorized to	solicit	contributions. DANCING.—Dancing in the Ball Room commences every evening at 9.15 o’clock (except Sunday); weather permitting. DECK GAMES AND AMUSEMENTS.—Deck Quoits, Shuffleboard, Bull Board and other games are provided on deck and which will be furnished by Deck Stewards. Chess, Draughts, Dominoes, etc., can be obtained on application to the Social Hall, Library or Tea room Stewards. A fully equipped Electric Bath, is located on Deck “G.” Experienced attendants are in charge. The Electric Baths will be available for ladies from 10 A.M. to 1 P.M. and for gentlemen from 2 to 7 P.M., tickets being obtainable at the Purser’s Office at $1.25 each. No charge is made for the use of the appliances. BOOKS.—Books are obtainable from the Library on deck “B” by application to the steward in charge. Books lost by passengers must be paid for. DIVINE SERVICES.—On Sundays at hours to be announced on ship board. BARBER, HAIRDRESSER, AND MANICURIST.—The Barber’s hours are from 8 A.M. to 7 P.M., but for the general convenience of the greater number, passengers are requested not to apply for hair-cutting or shampooing except between the hours of Noon and 5 P. M.. The Barber’s shop is located on “F” deck forward of swimming pool. A CLOTHES CLEANING AND PRESSING ROOM is in charge of an expert attendant. A printed tariff of charges may be obtained at the Purser’s Office. BOOTS AND SHOES will be cleaned if left outside stateroom door. 2 cents per folio for Carbon copies 30 cents minimum for a letter Particulars can be obtained at the Purser’s Office. BANKING.—FOREIGN MONEY EXCHANGE.—By arrangement with the UNITED STATES LINES, the FARMERS LOAN AND TRUST COMPANY has established on board a branch bank, which is located on the port side, “E” Deck, amidships. Passengers wishing to exchange money, or transact other banking business, will receive every attention. If passengers consider the charges made by the Surgeon for services rendered improper or excessive, they are requested, before paying same, to take up the question with the Surgeon, and the bill will be either adjusted to a basis that will be satisfactory to the passenger or withdrawn. The purpose of the UNITED STATES LINES is to make its service satisfactory to all passengers. BERTHING OF PASSENGERS.—No charges can be made except officially by the Purser. DECK CHAIRS AND RUGS may be hired for the voyage on application to the Deck Steward, rental $1.50 each. BAGGAGE.—Passengers are requested to check their baggage at the Baggage Master’s desk on the Pier before going aboard. It is recommended that Baggage be insured as the Company’s liability is limited in accordance with ticket. All inquiries regarding Baggage on board ship should be made at the Baggage Master’s Office, located on “E” Deck, amidships. On disembarking, passengers are specially requested to claim their baggage before leaving the Customs Baggage Room, otherwise considerable delay and extra charge for carriage may be incurred in forwarding to destination any baggage not accompanying passengers. BAGGAGE ROOM.—All baggage not marked for stateroom is placed in the Baggage Room, where access can be had to it during the voyage if required. VALUABLES.—The United States Lines are not responsible for theft of valuables or money kept in Staterooms. The same should be placed in charge of the Purser for deposit in his safe. PAYMENTS.—Passengers should obtain a receipt from the Purser, on the Company’s form, for any additional passage money, excess baggage or freight charges, etc., paid on board. PASSENGER ELEVATORS.—Four modern elevators are provided for the convenience of Cabin passengers. SUGGESTIONS AND COMPLAINTS.—Suggestions, complaints or criticisms of service or of personnel should be addressed to the General Manager, United States Lines, 45 Broadway, New York City. NOTICE.—Passengers are warned that professional gamblers are reported as frequently crossing on Atlantic steamers. DOGS are shipped as freight and are carried at the Owner's risk. The Company’s charge is $20.00 each, plus $4.50 payable to employee on board for attendance. Arrangements for carry-ing the dogs should be made by communicating with the UNITED STATES LINES, or if this has not been done, the Purser should be notified. Dogs cannot be landed in Great Britain unless a license has been previously procured from the Board of Agriculture, London. Forms of license must be obtained by direct application to the said Board before the dog is taken on ship. AMERICAN CUSTOMS REGULATIONS.—On the West-bound trip, baggage will be subject to inspection on landing in America as on landing abroad. Art. 352. Persons arriving from foreign countries.—Persons arriving from foreign countries are divided into two classes for customs purposes—first, residents of the United States returning from abroad, and, second, all other persons. Art. 353. Residence.—The residence of a wife follows that of her husband, and the residence of a minor child follows that of its parents. Citizens of the United States, or persons who have formerly resided in the United States, shall be deemed to be residents thereof returning from abroad, within the mean-ing of the tariff act, unless satisfactory evidence is presented that they had given up their place of abode in this country and acquired an actual fixed place of abode in a foreign country. Art. 354. Non-residents.—All persons not residents of the United States returning from abroad will be treated for customs purposes as non-residents, and are entitled to bring in free of duty all wearing apparel, articles of personal adornment, toilet articles, and similar personal effects, without limitation as to value, which were actually owned by them and in their possession abroad at the time of or prior to their departure from a foreign country which are necessary and proper for their wear and use, provided they are not intended for other persons or for sale. (a)	Articles up to but not exceeding $100 in value acquired abroad for personal or household use, or as souvenirs or curios, if not intended for sale or purchased on commissions for other persons. Such articles purchased or agreed to be purchased abroad by returning residents may be admitted free notwith-standing they do not accompany the passenger. (b)	All wearing apparel, personal and household effects, and articles for personal use take abroad by them, if not advanced in value or improved in condition while abroad. If such effects or articles be advanced in value or improved in condition while abroad by reason of repairs or cleaning further than that necessarily incident to their wear and use while abroad, or by remodelling or alterations, the cost or value of such repairs, cleaning, remodelling, or alterations is subject to duty, and must be declared. Such cost or value may, however, be included within the $100 exemption. Art. 356. Each member of family entitled to exemption.— Each member of the family is entitled to the exemption of $100 dor articles purchased abroad of the character described in paragraph 642 of the tariff act of October 3, 1913. When a husband and wife and minor and dependent children are travelling together the articles included within such exemption may be grouped and allowance made without regard to which member they belong. Par. 1695. Wearing apparel, articles of personal adornment, toilet articles, and similar personal effects of persons arriving in the United States; but this exemption shall include only •such articles as were actually owned by them and in their possession abroad at the time of or prior to their departure from a foreign country, and as are necessary and appropriate for the wear and use of such persons and are intended for such wear and use, and shall not be held to apply to merchandise or articles intended for other persons or for sale; Provided, That all jewelry and similar articles of personal adornment having a value of $300 or more, brought in by a non-resident of the United States, shall, if sold within three years after the date of the arrival of such person in the United States, be liable to duty at the rate or rates in force at the time of such sale, to be paid by such person; Provided further, That in case of residents of the United States returning from abroad all wearing apparel, personal and household effects taken by them out of the United States to foreign countries shall be admitted free of duty; without regard to their value, upon their identity being established under appropriate rules and regulations to be prescribed by the Secretary of the Treasury: Provided further, That up to but not exceeding $100 in value of articles acquired abroad by such residents of the United States for personal or household use or as souvenirs or curios, but not bought on commission or intended for sale, shall be admitted free of duty. RECOVERY OF U. S. HEAD TAX.—The United States Government imposes a “head tax” of $8.00 on all aliens. This tax can be recovered by passengers, if same has been paid, pro-vided they inform the U. S. Immigration Inspector on arrival at New York of their intention to leave the United States within sixty days (the time prescribed by U. S. Law), and obtain from him Transit Certificate Form 514, together with receipt for money paid. It is necessary for this Transit Certificate Form 514 to be handed to the transportation company when completed, in time to allow same to be placed before the Immigration Authorities in Washington within one hundred and twenty days of passenger’s arrival in the United States. ARRIVALS AT NEW YORK. Passengers are landed at the Company’s pier No. 86, North River, foot of West 46th Street, New York, where transportation tickets can be purchased and baggage checked to any part of the United States or Canada. After landing, passengers should inquire at the desk on the wharf for letters and telegrams. Should the steamer arrive at the pier after 8 P.M., passengers may remain on board over night and land after breakfast the following morning. PUBLIC TELEPHONES.—Telephone booths will be found on the pier at New York. HOTEL RESERVATION.—Owing to the fact that hotels in New York and other large cities are so often crowded, passen-gers are invited to take advantage of facilities offered by the United States Lines for reserving rooms in advance. Applica-tion should be made to the Purser’s Office. No charge is made for this wireless service, but the land tolls are collected. The General Offices of the UNITED STATES LINES is located at 45 Broadway, New York City, where the facilities afforded are based upon a thorough understanding of the requirements of the pleasure traveller and business man, and link with those of the branches throughout Europe, to provide all services in every department of Ocean Travel. TIME ON SHIPBOARD.—Between New York and London there is a difference in time of five hours, and as the sun rises in the East, as we say, when the ship is going eastward she meets sunlight earlier each day and thus gains time. Exactly how much is computed each day at noon, and the ship’s clocks are immediately set at the correct time for that longitude. On a vessel which makes the crossing in five days the clocks will be set ahead each day approximately an hour; on slower ships, of course, less. Going westward the clock is set back daily in similar fashion. On the voyage from Europe, owing to the alteration in time as the ship proceeds Westward, it is necessary to put the clock back every 24 hours. The alteration in time is made at about midnight, and the clock is usually put back 415 minutes on each occasion, the exact amount of time depending upon the distance the ship is estimated to make by noon the next day. During the first 24 hours, however, owing to the change from Mean Time to Apparent Time, the alteration is likely to be considerably more than 45 minutes, especially while Summer Time is in use. NOTE.—Seven bells in these two Watches are struck 10 minutes earlier to allow the Watch next for duty to have their breakfast and dinner respectively. One Bell is also struck at 3.45, 7.45, 11.45 A.M. and P.M. as warning to Watch below, i.e., off duty, to prepare to relieve the deck punctually at Eight Bells. KILOMETERS, KILOGRAMS, KNOTS and MILES.— “Kilo” is the abbreviation of “Kilogramme,” or kilogram, and a kilogramme is exactly 2.205 pounds. The “kilometer,” the French standard of distance measurement, and which is used generally on the Continent of Europe, is equal to 3,367.88 feet—approxi-mately ^ of a mile. The metre, or meter, the nearest continental measure to our yard, is 3.281 feet. A land mile measures 5,280 feet; a nautical or sea mile or “knot” is 6,080 feet in length. The continental standard of liquid measure is the “litre,” which is equal to 1.76 pounds. PORT AND STARBOARD.—Starboard is the right side of the ship, looking forward. Port, the left side. hour. Flowing in a north-easterly direction along the American coast, its current gradually widens and its velocity diminishes. Reaching the banks of Newfoundland it turns and sweeps across the Atlantic; then, dividing into two portions, it sends one arm down toward the Azores and the coast of Morocco, while the other passes near the shores of the British Isles and on to Norway. As it emerges from the Gulf of Mexico it has a temperature of 84 degrees in summer, higher than that of the ocean at the equator. Even by the time it has reached mid-Atlantic it has fallen not more than 14 degrees. The effect of the Stream upon the climate of Great Britain and the north-west coast of Europe 4,0	miles away from the Gulf, is to raise the winter temperature about 30 degrees above what would be the normal tempera-ture of those latitudes.